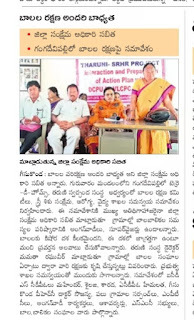 Tharuni , under SRHR Project of Terres De Hommes, Netherlands, held a Meeting for the Child Protection Committees Members on 24th at Gangadevipalli,Geesukonda Mandal, Warangal District. The Women Welfare and Child Development Department and Health Department collaborated with Tharuni. Women Welfare Officer Smt. Sabitha stated that the Anganwadi Workers and Supervisors will help the adolescent girls and boys who face certain problems at that age. Dr. Mamatha Raghuveer, Founder, Tharuni explained that hundreds of Girs and Boys Groups are formed in the 15 villages and the Child Protection Committees are a part of them. The Child Groups are able to solve their problems by bringing them to the notice of Local Authorities and Non Officials, and empower themselves, with their unity and network. The Meeting was attended by ICDS CDPOs, Mahender, Sailaja, Sarpanches of Villages,ACDPO Hemalatha, Geesukonda PHC Dr. Soujanya, MPTCs, Anganwadi Workers, ASHA Workers, SMC Members, Boys and Girls Groups Members.It could enlighten the Children to protect themselves.